Coffey Strong is working with the City of Santa Rosa and the Santa Rosa Parks Foundation to fund and restore the neighborhood park in Coffey park. 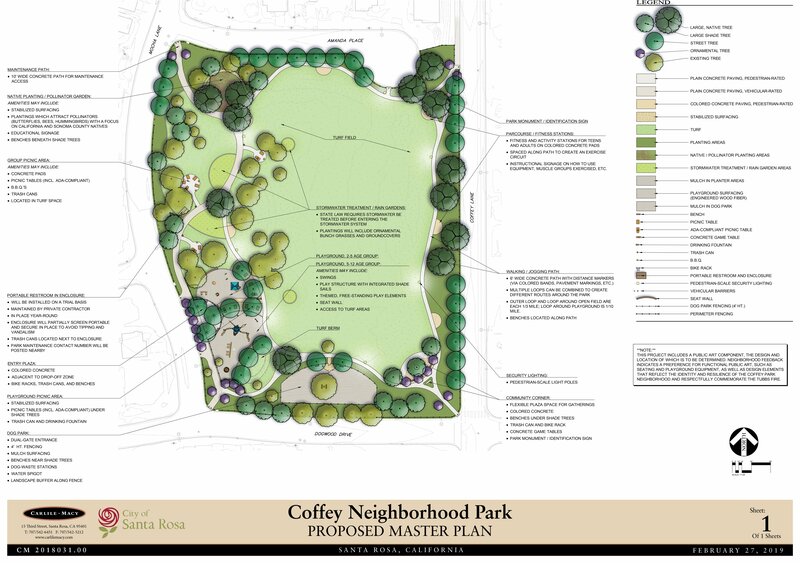 A series of neighborhood workshops were held during the fall and winter of 2018/19 to guide the development of the Master Plan for Coffey Neighborhood Park, a 5.85-acre park located in northwest Santa Rosa that was destroyed in the October 2017 Tubbs Fire. To make a donation to help restore our neighborhood park, please make a donation to the Santa Rosa Parks Foundation. Please designate your contribution for Coffey Park (as a memo line on your check). Visit their site to learn more and donate. Here is the proposed master plan for the redevelopment of our neighborhood park.